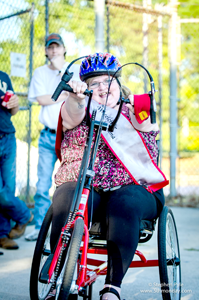 Adults with challenges to mobility and independence often struggle to find a means of exercise that works for them. Many try bike riding but face the challenge of getting it up to speed quickly enough to stay upright. The Amtryke operates from a tricycle platform with the goal of getting a rider balanced and feeling secure. Amtryke riders will increase cardio function, build strength and experience the outdoors in a new way, all of which can impact overall health and fitness. Not to mention the opportunity to ride with family and friends! 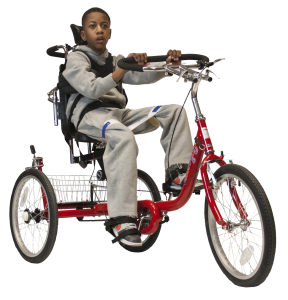 We offer a wide variety of adult-sized Amtrykes: Traditional upright-position trykes and recumbent street-style trykes for high functioning riders and trykes that offer full trunk support and rear-steering for riders who need more assistance. Adult riders can purchase an Amtryke directly or, if charitable assistance is needed, can go on the Wish List to wait for funding. Everyone receives an Amtryke but the wait can be up to two years.